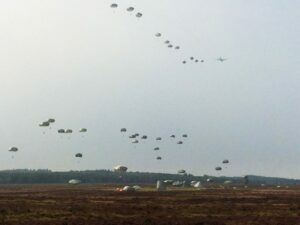 Today we are set to go early in the morning to the unique commemoration of airborne landings on Ginkelse Heide near Ede and Arnhem. Decided to go , for the expected number of spectators, to go on bike the last piece of the trip. On arrival it was already pretty busy. Walked to the Airborne Memorial. In September 1944 it was the largest airborne operation during the 2nd World War. Eventually there where even more droppings than during the D-Day landings. Just like 70 years the fog also played a role in the today droppings. No less than 60,000 visitors had come down to this unique event.